Canary Wharf is a major business district in east London. This financial hub of the capital is not typically associated with shipping containers its populated with some of the largest financial company’s in the world. It is a hive of activity with financial business trading and operation in a relatively small area. All workers need a good coffee and now this shipping container coffee shop is on hand to help. The second Shipping Container was made into a container bar with holes cut through for beer taps and electrics all fitted as per the customers requirements.This project was tricky as we couldn’t physically get a large rigid lorry into the shopping centre to drop the container on to the ground. Therefore our fit and healthy team had to carry each individual part up the stairs (or in the lift if it fitted!) and construct the container in its final position. This was a very tricky instillation but this structure should last nearly as long as the building its sitting in. As this bar was made from a new (one trip) shipping container, and as its also sitting inside and away from the weather this shipping container will last more or less forever. We do go the extra mile for our customers so that their wants and needs are met and expectations exceeded! Have a similar project in mind? Shipping containers are extremely versatile and can be modified to suit a host of different uses. 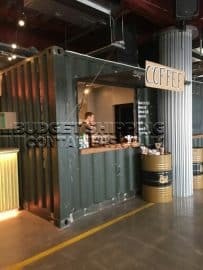 As well as a shipping container coffee shop we can also offer bars, serveries, offices and even shop and gym units. The Corten steel used in shipping containers is robust and reliable. Your standard new 20ft shipping container will last 20+ years with little to no maintenance. 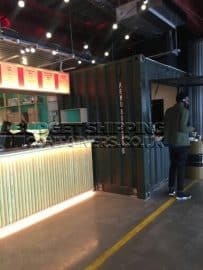 This shipping container is inside a shopping centre therefore is not exposed to the elements and will serve its purpose perfectly for the customer. Please feel free to contact us and our friendly and helpful team will be on hand to answer your questions!